WASHINGTON ““ In the showdown over the 2012 U.S. budget, Jewish organizations clearly fall on one particular side of the partisan divide: the Democratic one. But as the battle between Republicans and Democrats over spending gets under way, the trick the organizations are trying to pull off is appealing to both parties. For now, the organizations – which include groups whose boards boast major Republican givers – are strategizing on how best to protect medical subsidies they fear will be wiped out under Republican plans. The challenge is they’re warning that even if just some of the proposals touted by Rep. Paul Ryan (R-Wis.), the chairman of the House Budget Committee, make it into a final compromise budget, that would constitute a doomsday scenario. “We’re very concerned about whatever elements in the Medicare and Medicaid parts of the Ryan proposal make it into the discussions,” said Rachel Goldberg, the director of aging policy for B’nai B’rith International, which runs the largest network of Jewish homes for the elderly in the United States. Medicare is the federal program providing health coverage for those 65 and older. Medicaid covers the poor. Such apprehensions have led 17 national Jewish groups and more than 100 local groups to make their concerns clear in an unusually blunt letter to every Congress member that rejects the restructuring Ryan has proposed. The letter was notable in that its signatories came from every major religious stream – Reform, Orthodox, Conservative, and Reconstructionist – as well as an array of Jewish service groups. The major Jewish concerns with Ryan’s proposal have to do with his plan to deliver Medicaid in block grants – federal funds transferred to states for wide discretionary use – and with offering Medicare recipients an array of options through vouchers. Ryan says the voucher plan would strip away inefficiency by making Medicare providers competitive – “using competition to weed out inefficient providers, improve the quality of health care for seniors, and drive costs down,” as he wrote in an April 15 Washington Post op-ed piece. Jewish groups objecting to the voucher plan say it effectively reduces federal coverage for the elderly from three-quarters to one-third of the costs they incur. “The restructuring has a potential to compromise the guarantees in level of coverage that we’ve counted on and people depend on, and it changes the commitment we as a society make,” said Josh Protas, JCPA’s Washington director. Additionally, the choices inherent in a voucher program may appeal to the young, but not necessarily to the elderly, said Mark Olshan, B’nai B’rith’s associate executive vice president. “Having older people who are less healthy having to go through the myriad of options doesn’t make sense,” he said. Protas said Jewish groups object to block grants for Medicaid because the procedure would strip away requirements of coverage for vulnerable populations, including children and the elderly. If states have the autonomy to decide how to cover, he said, cash-strapped states may well choose to drop certain individuals from coverage. There are other objections to the Ryan budget: It essentially would repeal the reforms that President Obama signed into law last year that mandate health-care coverage and remove pre-existing conditions as a reason to deny coverage. That, Goldberg of B’nai B’rith says, would impel Americans not to take on new insurance – expecially those in the 55-65 age bracket who are out of work or in new jobs without insurance. It also would keep them from seeking preventative care, which would make them less healthy once they are eligible for Medicare – and more expensive to cover. The fact that Ryan’s proposed changes raise overwhelming objections places the groups in a potentially uncomfortable position: Aligned strictly with Democrats on a major issue. It’s not a problem that the organized community often faces, although it trends liberal on most issues. On Israel, there is unanimity of support from both parties. On energy independence, the community has favored solutions from both sides of the aisle – the Democrats’ clean energy investment and the Republicans’ development of American resources. When it comes to entitlements like the ones currently under debate, the Jewish community traditionally has cultivated moderate Republicans. But those voices have been muted by Tea Party victories in the last congressional elections and by the fervor with which the Republican Party has embraced the proposals touted by Ryan. His lucid, measured appearances explaining his budget have led some analysts already to mention him as a presidential hopeful. William Daroff, the director of the Jewish Federations’ Washington office, spoke to JTA just after he left an event in South Florida promoting services for Holocaust survivors. It was also attended by Reps. Ileana Ros-Lehtinen (R-Fla.) and Debbie Wasserman Schultz (D-Fla.), two of the most powerful women in their respective parties. Ros-Lehtinen is exactly the kind of moderate Republican Jewish aid groups have cultivated over the years, but Daroff acknowledged that bipartisan displays of support for entitlements like the one he had just attended would be increasingly rare. One strategy is to pitch service programs that cost less. Another is to acknowledge Ryan’s central political point, if not his solutions: The deficit is out of control. The next step, organizational officials interviewed by JTA said, is overcoming preconceptions prevalent among Jews that the issue is somehow remote from the community. 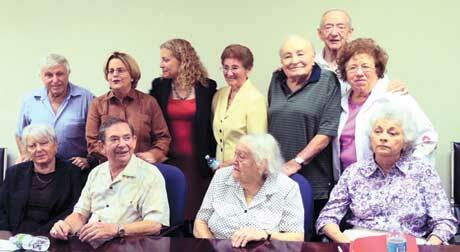 The bulk of funding for the Jewish elderly comes from Medicare and Medicaid, the officials noted. An educated community is better able to organize around an issue, they added, and use its influence in Congress.